Lake Erie is the southernmost Great Lake, located on both Canadian and USA territory, and measures about 26,000 km2. It was formed during the last glacial retreat about 4,000 years ago and has its main outlet through the Niagara Falls into Lake Ontario. Due to its relatively small water volume, it experiences the Great Lakes’ largest annual temperature amplitude. During summer, water temperatures reach 21o – 24oC, while during winter it has the largest ice coverage of all Great Lakes. The 100 m PROBA-V image of 5 January 2018 shows Lake Erie’s western part, largely covered by ice sheets and the snow-covered surrounding land. 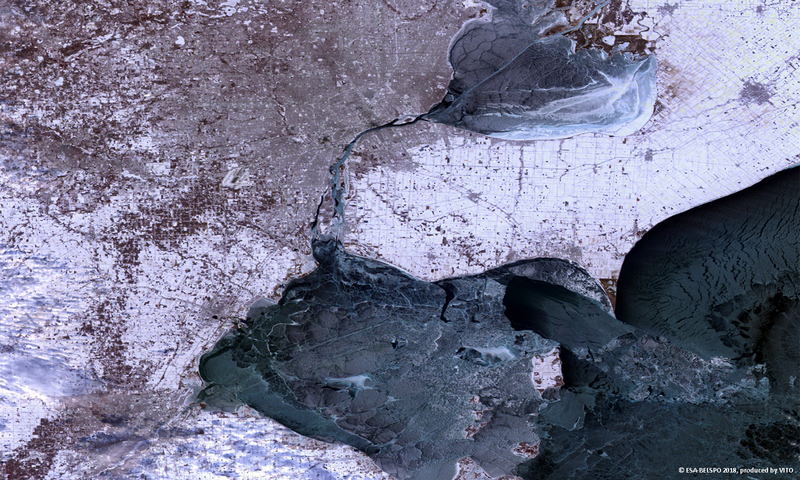 Lake Erie is connected with and replenished by Lake Saint Claire, which is visible in the image upper part. Detroit city, well-known for its large car manufacturing and musical legacy, is located at the southwestern shore of Lake Saint Claire.